Talk to most planners and architects today and you’ll hear lots of marketing terms like ‘smart growth’, ‘green building’, ‘sustainable management’ and so on. But these terms were created merely to soften the negative image of capitalist development within liberal social circles. Greenwashing is part and parcel of any new construction in our city, as Portland has banked heavily on its well-hyped reputation as a sustainable stronghold. 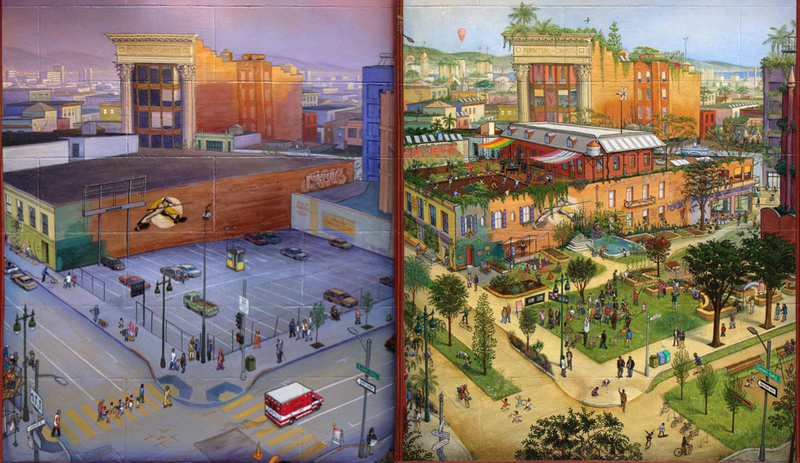 Developers talk about improvement and ‘good urbanism’, but for whom? Rarely does a city invest in bettering the streets and buildings of a neighborhood for the people who already live there. No, quite the contrary. The planners will readily admit this: new capital investments are made for incoming residents almost certainly of a higher income level than those already living here. Gentrification is not some unforeseen byproduct of increasing density or improving the livability of our streets. Cycles of divestment and gentrification are intentional, deliberate schemes formulated to generate the most profit possible for banks, developers, and private investors. The recipe is simple: build something new and rent it at top dollar, let people move in, let the neighborhood fall into ruin over the course of a generation or two, then cite ‘safety’, ‘crime’, ‘delapidation’ as reasons for radical redevelopment once the property value tanks, raze it all and build brand new shiny buildings for current waves of residents after you’ve priced out the existing community. Now jack the rent back up higher then ever, success! This is the way city hall and its real estate accomplices view neighborhoods – not as places to live, but as places to profit. Portland’s history of forced relocation of working class citizens, especially communities of color, is well documented. Through the Portland Development Commission’s callous direction, hundreds of black families saw their homes demolished to make way for freeways, private sports centers, and expanding hospitals that failed to actually expand. Such discriminatory land grabs were actually catalysts for urban insurrections carried out by the Black Panther Party of Portland in the sixties, seventies, and eighties. While this era of escalated direct action is now part of the city’s past, the real estate practices threatening Portland’s communities of color are still very real, and are seeing new generations of activists coordinating resistance. 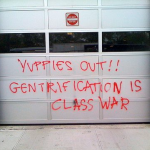 Keating advocated strategic vandalism to convey a political message, succinctly: “The yuppie takeover can be stopped.” Among MYEP’s ideas, Keaton’s posters urged making “yuppies feel unwelcome” with “graffiti, littering, and squatting” in unused residences. 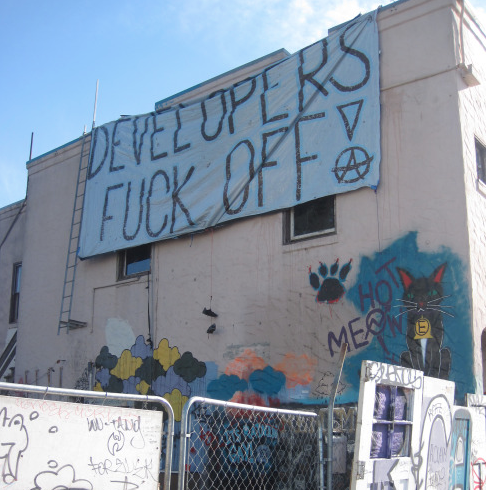 While such actions are certainly provocative, MYEP also advocated other manageable, long term solutions, like meeting and organizing with neighbors, supporting local business, boycotting chain stores, growing community gardens and pop-up parks, and creating renters unions and intentional communities. Despite the breadth of ideas propagated, years of posting flyers advocating nonviolent forms of property destruction led to Keating’s arrest on charges that were later reduced and then dropped. Urban sabotage aside, his core manifesto rings as true today as it did in the 90’s, “The issue is the fact that people under a certain income level are not going to be able to live in The City after too long. Poor people and the working class are just going to be pushed out.” His stint in the media limelight seemingly past, Keating continues to write about the decimating effects of gentrification on working class communities. While the common liberal response to tactical vandalism is to equate destruction of property with violence, this is a mistake. It’s easy to disagree with property destruction when you don’t understand its logic. But consider what it feels like to be marginalized, to be disenfranchised, to feel powerless as your community is ripped apart – everything you know of home and family is being radically altered by forces that care only for profit. Smashing a few windows out of desperation pales in comparison to the destruction of entire communities and their way of life. The development, known as BackBridge Lofts was originally planned as only four stories. However, recent rezoning backed by real estate interests will now permit buildings of up to 100 feet tall along N. Williams. Rapid change along this popular corridor has residents extremely concerned. So much so that a PBOT plan to expand the street’s bike lane elicited major blowback within a community all too familiar with Portland’s racist practices of displacement. For most, it wasn’t the bike lane that was the issue, but the gentrification that would follow. During a forum hosted by Multnomah County titled Race Talks, it was expressed by one individual that expanding bike access was purely an issue of safety. The general response by people of color spoke volumes: ‘You didn’t care about safety until you were trying to move in more white people.’ While the final design of the new N. Williams has ultimately disappointed many, the coverage in the Mercury provided a historical wake up call to many urban transplants. Such lessons are imperative. If we want socially healthy communities, we need to share and appreciate each others’ experiences. Surely urban planners and livable streets advocates can find common cause with our housing justice community. If urbanism is to be ‘good’, then we must take into account issues of street access alongside economic equity. We need to stop pretending the market will take care of people and solve these problems – it will not. If we choose to continue ignoring history, if we continue making the same mistakes, there are people who will surely act out in desperation. Seeing your home destroyed to make way for new development, being priced out of the neighborhood you grew up in, being evicted by force due to foreclosure – these are deeply traumatic experiences that will radicalize any normal, feeling individual. Portland is in a position to live up to it’s brand as a progressive, forward-thinking metropolis. Here’s hoping we don’t miss this opportunity to get things right. To learn more about Portland’s history of racial housing discrimination and the radicalization of Albina, please enjoy the following thesis by Lucas Burke entitled: THE MODEL CITY: Civil Rights, the Black Panther Party, and the Revolution of Urban Politics in Portland, Oregon. Pingback: Rebel Metropolis | Would Space Aliens Think Cars Are the Dominant Species? I love your blog posts. Really enlightening. And with such attitude! I was hoping you would mention a little about urban zoning laws. I am reading the book “The High Cost of Free Parking,” and it seems to me that zoning and neighborhood ordinances prioritize low density, expensive development, and pass off the costs to everyone else (not just the people who want low density, expensive development). But we all must learn from history. When a patient and a doctor come up with a medical plan, it ultimately is the patient who chooses to take the medicine. In the same way we must be letting neighborhoods choose how they want to develop, with the expert advice of urban planners.